As we seen in regards to the Orion 17 mission, the 17 enigma extends all the way to the Moon. Mankind's first direct contact with an extraterrestrial body happened with the Apollo 11 lunar landing at 20:17 UT. And the last contact we had with the Moon was with the Apollo 17 mission (which orbited the Moon for 17 hours). From wiki: "Apollo 17 was the eleventh (11) manned space mission in the NASA Apollo program...(t)he mission was launched at 12:33 a.m EST on December 7, 1972." Incidentally, the mission's full name was Apollo 17 (33). Why does that sound so familiar? "... for a mission patch [we] turned our pen-scratched ideas and goals over to artist Robert T. McCall, who helped us come up with a wonderful design based on the theme of mankind, country and the future. The golden face of Apollo, Greek god of the Sun, was laid on top of a contemporary drawing of an American eagle. Red bars in the wings reflected our flag, and were topped by three white stars representing our crew. A deep blue background featured the Moon, Saturn and a spiral galaxy, with the eagle's wing just touching the Moon to suggest that this celestial body had been visited by man. 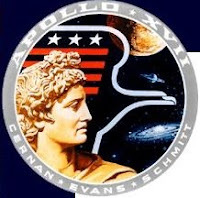 Apollo gazes to the right toward the galaxy to imply further exploration, with the eagle leading mankind into the future. So it appears that these patches don't simply self-generate, that the symbols are carefully chosen for maximum ritual effect. And it's fascinating to me that a design representing "mankind" and the "future" features an ancient sun god. Also, you may notice that the eagle in this patch was later borrowed for the US Postal Service's corporate logo. After splashdown, Apollo 17 was recovered by the USS Ticonderoga, the fourth ship to bear that name. It earned 17 battle stars for service during World War II and the Vietnam War. The first USS Ticonderoga (built in 1814) was a 17-gun schooner. My, my. Robert McCall is a name that should be familiar to regular readers of this blog. I first saw McCall's work in 1998 at an exhibition of his Masonic-themed futurist paintings put on by Jet Propulsion Laboratories (aka "Jack Parsons Laboratories") at the Liberty Science Center. At the same time the IMAX theatre there was (literally) initiating schoolchildren from the tri-state area into the Egyptian Mysteries. I'd been bouncing some ideas about the Apollo 17 mission patch around for the past couple of weeks but felt a piece was missing. That is until the gods of Synchronicty smiled upon me when I saw a link to this video on the Above Top Secret board. And suddenly all of the pieces fell into place. The producers here credit Cernan with the sketches shown, but those are obviously McCall's drawings. And how appropriate that all of this should culminate in the mysterious photograph of a pyramid on the surface of the Moon. I can't speak to the veracity of the pyramid image in this video. But it certainly fits in quite snugly with the overarching narrative of space colonization, Freemasonry and the ancient gods. The McCall link is simply the icing on the cake. And seriously, aren't we all expecting this sort of thing by now? It almost seems to me as if we are being fed these little disclosures, bit by bit. More easily digestible that way. I will say this- no matter what the astronomers may think, someone out there thinks the Age of Aquarius (or Horus, more accurately) is upon us. And my gut feeling is that it's going to be more Starship Troopers than "Good Morning, Starshine." UPDATE: Droidy has a link to a new series of Hoagland videos (17 in all!) on the Hyperdimensional Physics of the 2008 Election. Recently Barack Obama and Michelle Obama escaped from the White House and the cares of public office to visit the Capital City Public Charter School. President Obama read to a 2nd Grade class from a book called The Moon Over Star. President Obama's choice of reading material has observers scratching their heads to ascertain its significance if any. The Moon Over Star is a story of how the first Moon landing in 1969 inspires a young African American girl to better her own life and embrace its possibilities.